There were a lot of cool things unveiled at this year’s New York Toy Fair, but Hasbro may have topped them all when they introduced the galaxy to the Star Wars Ultimate Co-pilot Chewie. As the newest addition to their FurReal line not only is the 16” tall animatronic fuzz ball cute to look at he also comes complete with 100 different sound and motion combinations. If you touch his stomach he’ll laugh, say hello and Chewie will raise his arms and respond with a roar. And he even has a number of surprising facial expressions. Chewie also has a built-in accelerometer which allows him to react to different kinds of movement. Picking him up, flying him around or shaking him will all elicit a different reaction. Possibly the best thing, or, at the very least the cutest thing is when you rock him in your arms he closes his eyes and goes to sleep complete with a loud Wookie snore. 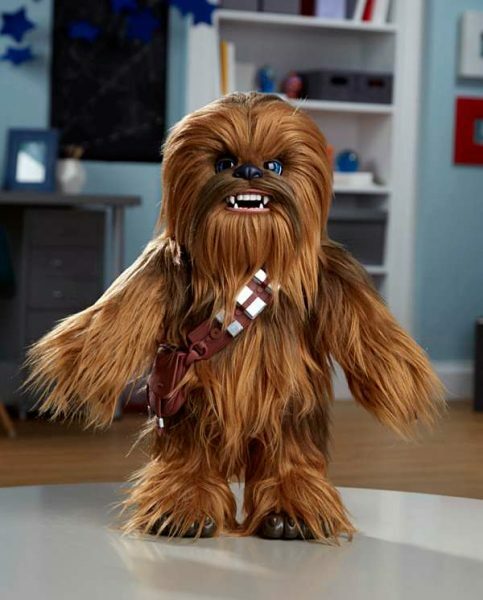 Hasbro’s Star Wars Ultimate Co-Pilot Chewie is for children ages 4 and up and will cost $129.99. The bad news is the galaxy’s favorite furry smuggler won’t be available until the Fall.